Western Australia boasts a cool 12,000 kilometres of coastline, earning it more spectacular beaches than anywhere else in Australia. From the mainland to the islands, we list 12 of the best. With the star attraction here being petite penguins, it’s easy to see why this is one of Australia’s most prized nature-based tourism attractions. A 45-minute drive south of Perth and a five-minute ferry ride will get you to the island, where you’ll find the smallest penguins in the world. At the Discovery Centrae rangers host three daily penguin feedings, providing the best opportunity to see these little guys. Penguin Island is in the heart of the Shoalwater Islands Marine Park, teeming with wildlife including dolphins, sea lions, stingrays, pelicans and seabirds. The island closes from early June to mid-September each year for the winter penguin nesting season. Arguably Perth’s most popular beach, ‘Cott’ is the ideal spot for swimming, snorkelling and surfing — not to mention stunning sunsets. It’s a picturesque favourite among Perth’s 19 white-sand beaches, with shady Norfolk Island pines, smooth lawns and clear waters. Cottesloe Beach can be reached by car, bus or train from Perth, and if you visit in March you’ll be treated to an outdoor gallery space when the artistic displays of Sculpture by the Sea takes over the foreshore. Soft, white sands lap against the calm waters of the Indian Ocean at this family-friendly beach, just a 20-minute drive from Perth’s CBD. A great swimming beach suitable for children of all ages, Mullaloo is patrolled on weekends by surf lifesavers. Kids will also lap up the excellent playground facilities and parklands that overlook the beach. Adults might want to pack a fishing rod, and head north of the main car park, where you’ll find a popular fishing spot. Hailed Australia’s whitest beach, Lucky Bay stretches five kilometres along the coast of Cape Le Grand National Park, a 40-minute drive east of Esperance. Turquoise waters, squeaky-clean sand, ideal swimming conditions, curious kangaroos and views of the Recherche Archipelago often earn Lucky Bay a top spot in a list of the country’s best beaches. Daily Indigenous cultural and eco-tours depart from Esperance, and several walking tracks provide views of whales between July and October. Famous for its smiley quokkas, Rottnest Island isn’t just home to these mini marsupials — here you’ll find 20 bays, 63 secluded beaches, and unique coral reefs. Cars aren’t permitted on the island, which lies just 18 kilometres offshore from Perth, so be prepared to walk or hop on a bicycle. Of course swimming, surfing and snorkelling are other fun options. A popular day trip from the city, Rottnest can be reached in 25 minutes from Fremantle, 45 minutes from Hillarys Boat Harbour or 90 minutes from Perth’s Barrack Street Jetty. On the edge of William Bay National Park in Denmark, more than four hours’ drive south of Perth, visitors can discover one of Western Australia’s most beautiful beaches. Here, at Greens Pool, turquoise waters and rock pools mean for great snorkelling, and huge sculpted rock boulders make for interesting sights on a stroll over the headland. The journey to this magical spot is special in itself, as you’ll pass through forests of giant timber trees. The protected waters and white sands of Meelup Beach have ensured it remains a favourite for holidaying families, and boat owners who drop anchor to enjoy swimming and unwinding here. Surrounded by bushland, the area offers a number of coastal trails where, in spring, you’ll come across vibrant wildflowers, and in late winter perhaps some migrating whales. For a few evenings in summer the full moon rises from the Indian Ocean over Meelup — one of the few beaches in Western Australia to view this ‘staircase to the moon’ spectacle. 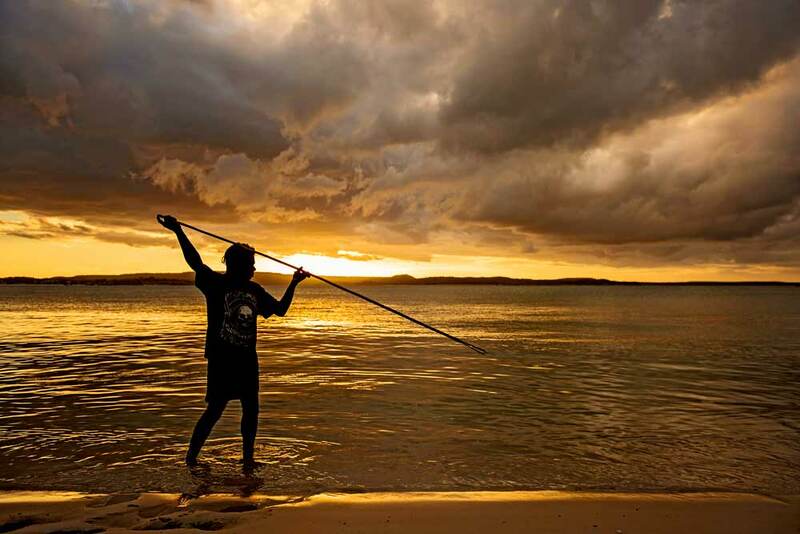 Fittingly, the word “Meelup” means “place of the moon rising” in the local Wardandi Aboriginal language. At 300 kilometres long, World Heritage-listed Ningaloo Reef is one of the largest fringing coral reefs in the world, and can be reached just footsteps from the beach. 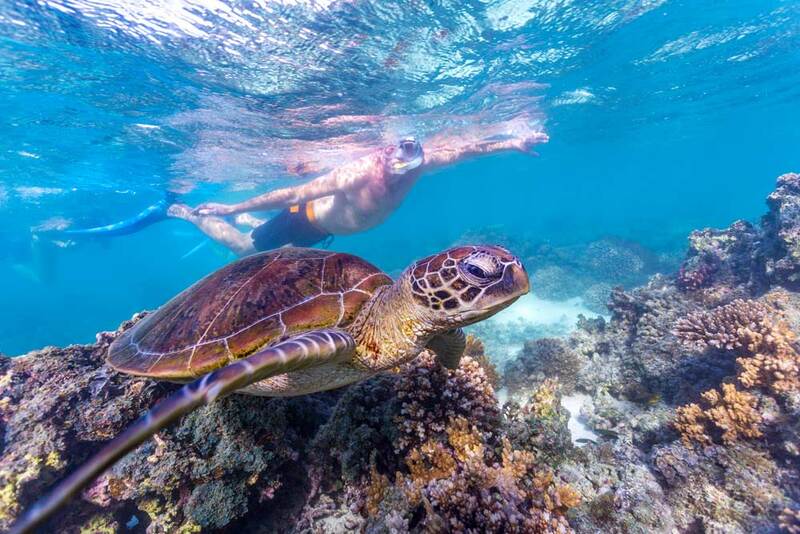 Visitors can swim alongside hundreds of colourful, tropical fish and enjoy pristine coral gardens at a number of do-it-yourself snorkelling sites at Exmouth’s Cape Range National Park or Coral Bay. Tours to swim with whale sharks take place between March and August, and other eco-tours to spot sea turtles, humpback whales, orcas, dugong, manta rays and reef sharks are also on offer. Sugarloaf Rock in the Leeuwin-Naturaliste National Park, three hours’ drive south of Perth, is one of the most photographed seascapes in the state. The striking rock formation is found on the coastline near Cape Naturaliste. Despite the powerful swell, experienced fishermen attempt the challenge at the edge of the rock, but if you’d prefer to stay on safe ground set foot on the Cape to Cape track, which takes in sights of Sugarloaf Rock and other spectacular vistas over the Indian Ocean. In the north of the state, halfway between Broome and Port Hedland, Eighty Mile Beach stretches endlessly with pure white sand. Offering solitude, it’s a well-known area for fishing and bird-watching, and each year an astonishing half a million migratory shorebirds descend here, flying in from their feeding and breeding grounds in the Arctic Circle. To drive, it’s about two-and-a-half hours north of Port Hedland, or four hours south of Broome. A standout location in the Cape Range National Park of Exmouth, Turquoise Bay is regularly voted among the top-three best beaches in all of Australia, thanks to the crystal-clear water of Ningaloo Reef Lagoon, brilliant white sand and dense coral beds. The bay is home to hundreds of species of brightly coloured reef fish, as well as sea turtles, harmless reef sharks and stingrays. There’s not a monkey in sight, but dozens of playful dolphins more than make up for it. One of the state’s most famous dolphin-watching destinations, Monkey Mia is where you’ll find pods of the friendly mammals visiting the shores to be handfed. Less than a two-hour flight from Perth, Monkey Mia in the Shark Bay World Heritage Area offers a unique opportunity to get up close to dolphins in their natural habitat. 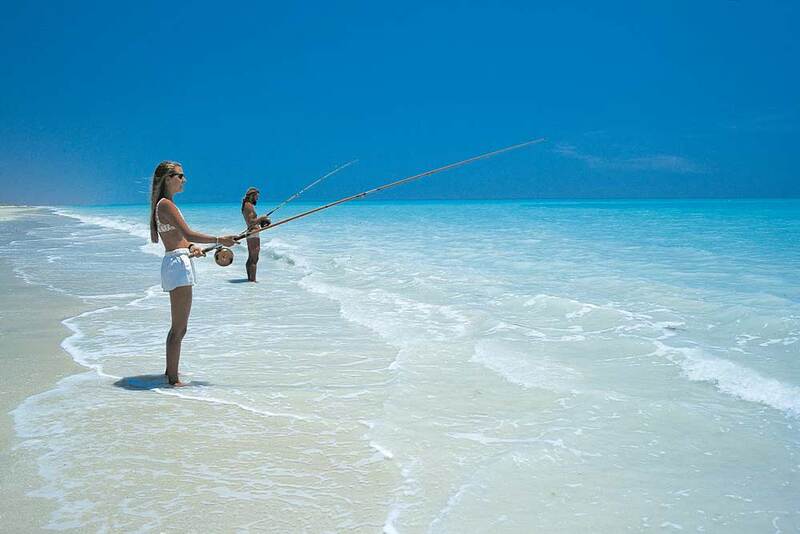 Want to explore new waters and drop a line for some serious fishing action? 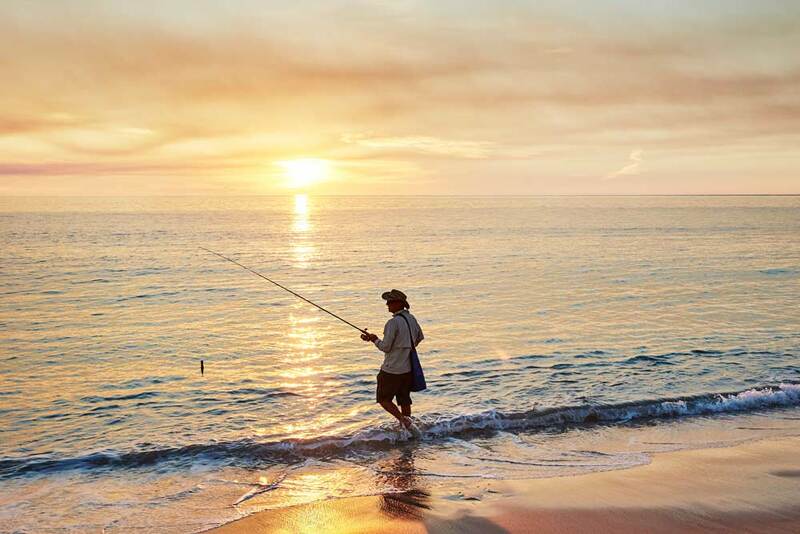 Australia and New Zealand offer some of the best fishing spots in the world. Here are our tips on where to go and the best operators to hook up with. Vanuatu is only a three-hour plane journey from Australia, and yet it feels completely off the grid.